Los Angeles-based rockers EDGE OF PARADISE created a buzz with their five-song EP, Alive, last year, and have a busy 2018 planned - which will only help spread the word further about this fast-rising band. 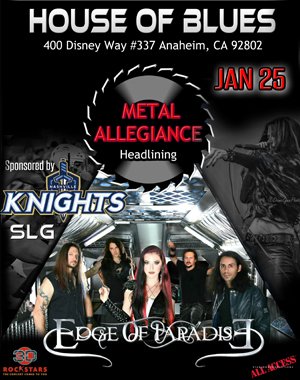 Comprised of members Margarita Monet - vocals, Dave Bates - guitar, David Ruiz - second guitar, Nick Ericson - bass, and John Chominsky - drums, EDGE OF PARADISE will be appearing on a bill headlined by METAL ALLEGIANCE on January 25th at the House of Blues in Anaheim (also appearing on the bill will be WEDNESDAY 13, SUPERFIX, and Musician Institute Band). And on January 25th, metal fans in Anaheim will get a taste of things to come this year, from the mighty EDGE OF PARADISE.